Proprietary Name: Phenobarbital What is the Proprietary Name? Non-Proprietary Name: Phenobarbital What is the Non-Proprietary Name? Phenobarbital with NDC 13517-113 is a a human prescription drug product labeled by E5 Pharma, Llc. The generic name of Phenobarbital is phenobarbital. The product's dosage form is tablet and is administered via oral form. Start Marketing Date: 02-24-2017 What is the Start Marketing Date? Why is phenobarbital medication prescribed? Each phenobarbital tablet contains 16.2 mg, 32.4 mg, 64.8 mg, or 97.2 mg of phenobarbital, USP. Inactive ingredients include: colloidal silicon dioxide, lactose anhydrous, magnesium stearate, microcrystalline cellulose, sodium starch glycolate, and stearic acid. Barbiturates are absorbed in varying degrees following oral or parenteral administration. The salts are more rapidly absorbed than are the acids. The rate of absorption is increased if the sodium salt is ingested as a dilute solution or taken on an empty stomach.Duration of action, which is related to the rate at which the barbiturates are redistributed throughout the body, varies among persons and in the same person from time to time. Phenobarbital is classified as a long-acting barbiturate when taken orally. Its onset of action is 1 hour or longer, and its duration of action ranges from 10 to 12 hours.Barbiturates are weak acids that are absorbed and rapidly distributed to all tissues and fluids, with high concentrations in the brain, liver, and kidneys. Lipid solubility of the barbiturates is the dominant factor in their distribution within the body. The more lipid soluble the barbiturate, the more rapidly it penetrates all tissues of the body. Barbiturates are bound to plasma and tissue proteins to a varying degree with the degree of binding, increasing directly as a function of lipid solubility.Phenobarbital has the lowest lipid solubility, lowest plasma binding, lowest brain protein binding, the longest delay in onset activity, and the longest duration of action. The plasma half-life for phenobarbital in adults ranges between 53 and 118 hours with a mean of 79 hours. The plasma half-life for phenobarbital in children and newborns (less than 48 hours old) ranges between 60 to 180 hours with a mean of 110 hours.Barbiturates are metabolized primarily by the hepatic microsomal enzyme system, and the metabolic products are excreted in the urine and, less commonly, in the feces. Approximately 25% to 50% of a dose of phenobarbital is eliminated unchanged in the urine. The excretion of unmetabolized barbiturate is one feature that distinguishes the long-acting category from those belonging to other categories, which are almost entirely metabolized. The inactive metabolites of the barbiturates are excreted as conjugates of glucuronic acid. SedativeAnticonvulsant – For the treatment of generalized and partial seizures. Phenobarbital is contraindicated in patients who are hypersensitive to barbiturates, in patients with a history of manifest or latent porphyria, and in patients with marked impairment of liver function or respiratory disease in which dyspnea or obstruction is evident. Acute or Chronic Pain. Caution should be exercised when barbiturates are administered to patients with acute or chronic pain, because paradoxical excitement could be induced or important symptoms could be masked. However, the use of barbiturates as sedatives in the postoperative surgical period and as adjuncts to cancer chemotherapy is well established. DRUG ABUSE AND DEPENDENCE). If phenobarbital is used during pregnancy or if the patient becomes pregnant while taking this drug, the patient should be apprised of the potential hazard to the fetus. Usage in Pediatric Patients. Phenobarbital has been reported to be associated with cognitive deficits in children taking it for complicated febrile seizures. Synergistic Effects. The concomitant use of alcohol or other CNS depressants may produce additive CNS depressant effects. DRUG ABUSE AND DEPENDENCE). Barbiturates should be administered with caution, if at all, to patients who are mentally depressed, have suicidal tendencies, or have a history of drug abuse. Elderly or debilitated patients may react to barbiturates with marked excitement, depression, or confusion. In some persons, especially children, barbiturates repeatedly produce excitement rather than depression.In patients with hepatic damage, barbiturates should be administered with caution and initially in reduced doses. Barbiturates should not be administered to patients showing the premonitory signs of hepatic coma.The systemic effects of exogenous and endogenous corticosteroids may be diminished by phenobarbital. Thus, this product should be administered with caution to patients with borderline hypoadrenal function, regardless of whether it is of pituitary or of primary adrenal origin. The following information and instructions should be given to patients receiving barbiturates.The use of barbiturates carries with it an associated risk of psychological and/or physical dependence. The patient should be warned against increasing the dose of the drug without consulting a physician.Barbiturates may impair the mental and/or physical abilities required for the performance of potentially hazardous tasks, such as driving a car or operating machinery. The patient should be cautioned accordingly.Alcohol should not be consumed while taking barbiturates. The concurrent use of the barbiturates with other CNS depressants (e.g., alcohol, narcotics, tranquilizers, and antihistamines) may result in additional CNS-depressant effects. Most reports of clinically significant drug interactions occurring with the barbiturates have involved phenobarbital. However, the application of these data to other barbiturates appears valid and warrants serial blood level determinations of the relevant drugs when there are multiple therapies.Anticoagulants. Phenobarbital lowers the plasma levels of dicumarol and causes a decrease in anticoagulant activity as measured by the prothrombin time. Barbiturates can induce hepatic microsomal enzymes resulting in increased metabolism and decreased anticoagulant response of oral anticoagulants (e.g., acenocoumarol, warfarin, dicumarol, and phenprocoumon). Patients stabilized on anticoagulant therapy may require dosage adjustments if barbiturates are added to or withdrawn from their dosage regimen. Corticosteroids. Barbiturates appear to enhance the metabolism of exogenous corticosteroids, probably through the induction of hepatic microsomal enzymes. Patients stabilized on corticosteroid therapy may require dosage adjustments if barbiturates are added to or withdrawn from their dosage regimen. Griseofulvin. Phenobarbital appears to interfere with the absorption of orally administered griseofulvin, thus decreasing its blood level. The effect of the resultant decreased blood levels of griseofulvin on therapeutic response has not been established. However, it would be preferable to avoid concomitant administration of these drugs. Doxycycline. Phenobarbital has been shown to shorten the half-life of doxycycline for as long as 2 weeks after barbiturate therapy is discontinued. 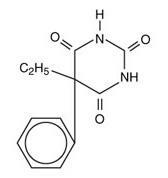 This mechanism is probably through the induction of hepatic microsomal enzymes that metabolize the antibiotic. If phenobarbital and doxycycline are administered concurrently, the clinical response to doxycycline should be monitored closely. Phenytoin, Sodium Valproate, Valproic Acid. The effect of barbiturates on the metabolism of phenytoin appears to be variable. Some investigators report an accelerating effect, whereas others report no effect. Because the effect of barbiturates on the metabolism of phenytoin is not predictable, phenytoin and barbiturate blood levels should be monitored more frequently if these drugs are given concurrently. Sodium valproate and valproic acid increase the phenobarbital serum levels; therefore, phenobarbital blood levels should be closely monitored and appropriate dosage adjustments made as clinically indicated. CNS Depressants. The concomitant use of other CNS depressants, including other sedatives or hypnotics, antihistamines, tranquilizers, or alcohol, may produce additive depressant effects. Monoamine Oxidase Inhibitors (MAOIs). MAOIs prolong the effects of barbiturates, probably because metabolism of the barbiturate is inhibited. Estradiol, Estrone, Progesterone, and other Steroidal Hormones. Pretreatment with or concurrent administration of phenobarbital may decrease the effect of estradiol by increasing its metabolism. There have been reports of patients treated with antiepileptic drugs (e.g., phenobarbital) who become pregnant while taking oral contraceptives. An alternate contraceptive method might be suggested to women taking phenobarbital. Human Data. In a 29-year epidemiological study of 9,136 patients who were treated on an anticonvulsant protocol that included phenobarbital, results indicated a higher than normal incidence of hepatic carcinoma. Previously, some of these patients had been treated with thorotrast, a drug which is known to produce hepatic carcinomas. Thus, this study did not provide sufficient evidence that phenobarbital sodium is carcinogenic in humans. Hypnotic doses of barbiturates do not appear to impair uterine activity significantly during labor. Full anesthetic doses of barbiturates decrease the force and frequency of uterine contractions. Administration of sedative-hypnotic barbiturates to the mother during labor may result in respiratory depression in the newborn. Premature infants are particularly susceptible to the depressant effects of barbiturates. If barbiturates are used during labor and delivery, resuscitation equipment should be available.Data are not available to evaluate the effect of barbiturates when forceps delivery or other intervention is necessary or to determine the effect of barbiturates on the later growth, development, and functional maturation of the child. Caution should be exercised when phenobarbital is administered to a nursing woman, because small amounts of barbiturates are excreted in the milk. The following adverse reactions have been reported:CNS Depression – Residual sedation or “hangover”, drowsiness, lethargy, and vertigo. Emotional disturbances and phobias may be accentuated. In some persons, barbiturates such as phenobarbital repeatedly produce excitement rather than depression, and the patient may appear to be inebriated. Irritability and hyperactivity can occur in children. Like other nonanalgesic hypnotic drugs, barbiturates such as phenobarbital, when given in the presence of pain, may cause restlessness, excitement, and even delirium. Rarely, the use of barbiturates results in localized or diffuse myalgic, neuralgic, or arthritic pain, especially in psychoneurotic patients with insomnia. The pain may appear in paroxysms, is most intense in the early morning hours, and is most frequently located in the region of the neck, shoulder girdle, and upper limbs. Symptoms may last for days after the drug is discontinued. Respiratory/Circulatory – Respiratory depression, apnea, circulatory collapse. Allergic – Acquired hypersensitivity to barbiturates consists chiefly in allergic reactions that occur especially in persons who tend to have asthma, urticaria, angioedema, and similar conditions. Hypersensitivity reactions in this category include localized swelling, particularly of the eyelids, cheeks, or lips, and erythematous dermatitis. Rarely, exfoliative dermatitis (e.g., Stevens-Johnson syndrome and toxic epidermal necrolysis) may be caused by phenobarbital and can prove fatal. The skin eruption may be associated with fever, delirium, and marked degenerative changes in the liver and other parenchymatous organs. In a few cases, megaloblastic anemia has been associated with the chronic use of phenobarbital. Other – Nausea and vomiting; headache, osteomalacia. Phenobarbital is a Schedule IV drug. Barbiturates may be habit forming. Tolerance, psychological dependence, and physical dependence may occur, especially following prolonged use of high doses of barbiturates. Daily administration in excess of 400 mg of pentobarbital or secobarbital for approximately 90 days is likely to produce some degree of physical dependence. A dosage of 600 to 800 mg taken for at least 35 days is sufficient to produce withdrawal seizures. The average daily dose for the barbiturate addict is usually about 1.5 g. As tolerance to barbiturates develops, the amount needed to maintain the same level of intoxication increases; tolerance to a fatal dosage, however, does not increase more than twofold. As this occurs, the margin between intoxicating dosage and fatal dosage becomes smaller.Symptoms of acute intoxication with barbiturates include unsteady gait, slurred speech, and sustained nystagmus. Mental signs of chronic intoxication include confusion, poor judgment, irritability, insomnia, and somatic complaints.Symptoms of barbiturate dependence are similar to those of chronic alcoholism. If an individual appears to be intoxicated with alcohol to a degree that is radically disproportionate to the amount of alcohol in his or her blood, the use of barbiturates should be suspected. The lethal dose of a barbiturate is far less if alcohol is also ingested.The symptoms of barbiturate withdrawal can be severe and may cause death. Minor withdrawal symptoms may appear 8 to 12 hours after the last dose of a barbiturate. These symptoms usually appear in the following order: anxiety, muscle twitching, tremor of hands and fingers, progressive weakness, dizziness, distortion in visual perception, nausea, vomiting, insomnia, and orthostatic hypotension. Major withdrawal symptoms (convulsions and delirium) may occur within 16 hours and last up to 5 days after abrupt cessation of barbiturates. The intensity of withdrawal symptoms gradually declines over a period of approximately 15 days. Individuals susceptible to barbiturate abuse and dependence include alcoholics and opiate abusers as well as other sedative-hypnotic and amphetamine abusers.Drug dependence on barbiturates arises from repeated administration of a barbiturate or agent with barbiturate-like effect on a continuous basis, generally in amounts exceeding therapeutic dose levels. The characteristics of drug dependence on barbiturates include: (a) a strong desire or need to continue taking the drug; (b) a tendency to increase the dose; (c) a psychic dependence on the effects of the drug related to subjective and individual appreciation of those effects; and (d) a physical dependence on the effects of the drug, requiring its presence for maintenance of homeostasis and resulting in a definite, characteristic, and self-limited abstinence syndrome when the drug is withdrawn.Treatment of barbiturate dependence consists of cautious and gradual withdrawal of the drug. Barbiturate-dependent patients can be withdrawn by using a number of different withdrawal regimens. In all cases, withdrawal requires an extended period of time. One method involves substituting a 30-mg dose of phenobarbital for each 100- to 200-mg dose of barbiturate that the patient has been taking. The total daily amount of phenobarbital is then administered in 3 or 4 divided doses, not to exceed 600 mg daily. If signs of withdrawal occur on the first day of treatment, a loading dose of 100 to 200 mg of phenobarbital may be administered IM in addition to the oral dose. After stabilization on phenobarbital, the total daily dose is decreased by 30 mg/day as long as withdrawal is proceeding smoothly. A modification of this regimen involves initiating treatment at the patient’s regular dosage level and decreasing the daily dosage by 10% if tolerated by the patient.Infants who are physically dependent on barbiturates may be given phenobarbital, 3 to 10 mg/kg/day. After withdrawal symptoms (hyperactivity, disturbed sleep, tremors, and hyperreflexia) are relieved, the dosage of phenobarbital should be gradually decreased and completely withdrawn over a 2-week period. Signs and Symptoms – The onset of symptoms following a toxic oral exposure to phenobarbital may not occur until several hours following ingestion. The toxic dose of barbiturates varies considerably. In general, an oral dose of 1 g of most barbiturates produces serious poisoning in an adult. Death commonly occurs after 2 to 10 g of ingested barbiturate. The sedated, therapeutic blood levels of phenobarbital range from 5 to 40 mcg/mL; the usual lethal blood level ranges from 100 to 200 mcg/mL. Barbiturate intoxication may be confused with alcoholism, bromide intoxication, and various neurologic disorders. Potential tolerance must be considered when evaluating significance of dose and plasma concentration. The manifestations of a long-acting barbiturate in overdose include nystagmus, ataxia, CNS depression, respiratory depression, hypothermia, and hypotension. Other findings may include absent or depressed reflexes and erythematous or hemorrhagic blisters (primarily at pressure points). Following massive exposure to phenobarbital, pulmonary edema, circulatory collapse with loss of peripheral vascular tone, cardiac arrest, and death may occur.In extreme overdose, all electrical activity in the brain may cease, in which case a “flat” EEG normally equated with clinical death should not be accepted. This effect is fully reversible unless hypoxic damage occurs.Consideration should be given to the possibility of barbiturate intoxication even in situations that appear to involve trauma.Complications such as pneumonia, pulmonary edema, cardiac arrhythmias, congestive heart failure, and renal failure may occur. Uremia may increase CNS sensitivity to barbiturates if renal function is impaired. Differential diagnosis should include hypoglycemia, head trauma, cerebrovascular accidents, convulsive states, and diabetic coma.Treatment – To obtain up-to-date information about the treatment of overdose, a good resource is your certified Regional Poison Control Center. Telephone numbers of certified poison control centers are listed in the Physicians’ Desk Reference (PDR). In managing overdosage, consider the possibility of multiple drug overdoses, interaction among drugs, and unusual drug kinetics in your patient. Protect the patient’s airway and support ventilation and perfusion. Meticulously monitor and maintain, within acceptable limits, the patient’s vital signs, blood gases, serum electrolytes, etc. Absorption of drugs from the gastrointestinal tract may be decreased by giving activated charcoal, which, in many cases, is more effective than emesis or lavage; consider charcoal instead of or in addition to gastric emptying. Repeated doses of charcoal over time may hasten elimination of some drugs that have been absorbed. Safeguard the patient’s airway when employing gastric emptying or charcoal.Alkalinization of urine hastens phenobarbital excretion, but dialysis and hemoperfusion are more effective and cause less troublesome alterations in electrolyte equilibrium. If the patient has chronically abused sedatives, withdrawal reactions may be manifest following acute overdose. The dose of phenobarbital must be individualized with full knowledge of its particular characteristics. Factors of consideration are the patient’s age, weight, and condition.Sedation:For sedation, the drug may be administered in single dose of 30 to 120 mg repeated at intervals: frequency will be determined by the patient’s response. It is generally considered that no more than 400 mg of phenobarbital should be administered during a 24-hour period.Adults:Daytime Sedation: 30 to 120 mg daily in 2 to 3 divided doses.Oral Hypnotic: 100 to 200 mg.Anticonvulsant Use – Clinical laboratory reference values should be used to determine the therapeutic anticonvulsant level of phenobarbital in the serum. To achieve the blood levels considered therapeutic in pediatric patients, higher per-kilogram dosages are generally necessary for phenobarbital and most other anticonvulsants. In children and infants, phenobarbital at a loading dose of 15 to 20 mg/kg produces blood levels of about 20 mcg/mL shortly after administration. Phenobarbital has been used in the treatment and prophylaxis of febrile seizures. However, it has not been established that prevention of febrile seizures influences the subsequent development of epilepsy.Adults: 60 to 200 mg/day.Pediatric Patients: 3 to 6 mg/kg/day.Special Patient Population – Dosage should be reduced in the elderly or debilitated because these patients may be more sensitive to barbiturates. Dosage should be reduced for patients with impaired renal function or hepatic disease. Phenobarbital Tablets, USP 16.2 mg: White, round, tablets scored on one side and debossed “e5" above the score and "110” below the score. The other side is plain. Available in bottles of 100 tablets, NDC 13517-110-01 and 1000 tablets, NDC 13517-110-10. Phenobarbital Tablets, USP 32.4 mg: White, round, tablets scored on one side and debossed “e5" above the score and "111” below the score. The other side is plain. Available in bottles of 100 tablets, NDC 13517-111-01 and 1000 tablets, NDC 13517-111-10. Phenobarbital Tablets, USP 64.8 mg: White, round, tablets scored on one side and debossed “e5" above the score and "112” below the score. The other side is plain. Available in bottles of 100 tablets, NDC 13517-112-01 and 1000 tablets, NDC 13517-112-10. Phenobarbital Tablets, USP 97.2 mg: White, round, tablets scored on one side and debossed “e5" above the score and "113” below the score. The other side is plain. Available in bottles of 100 tablets, NDC 13517-113-01 and 1000 tablets, NDC 13517-113-10.